OCEANS ENTERPRISES - AUSTRALIAN HIPWRECKS - UNDERWATER BOOKS, DIVING BOOKS.
. Link image for all book categories. . . . . All prices are $ Australian. 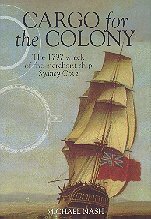 Government Publications, for several excellent shipwreck books relevant to South Australia and Victoria. Maritime History, Salvage and Treasure, and World Shipwrecks. Jack Loney publications (below, this page). DVD - The Tragic Trio by Max Gleeson. See DVD and Video page. This rather large volume includes no less than 15,600 alphabetic entries of vessels of all rigs, sizes, and shapes, that have been lost, or involved in a major maritime incident. It includes vessels lost on 'The Australia Run', and vessels lost anywhere in the world, providing they have some connection with Australia, through previous arrival in Australia, construction, or ownership. The Encyclopedia is the definitive reference on Australian ship losses. Such a listing has never before been achieved. That it has now been published is due to the extensive primary research of some three hundred authors of shipwreck and maritime publications. The objective is to provide a short entry for each vessel, with relevant physical details, history, and information on her loss or incident. This is followed by a code to a published book or reference so as to provide the reader with a means of finding further information; the encyclopedia is thus very much a bibliography. The ship listing may also include other incidents relevant to the vessel, an indication if her actual location if known, and her condition as she lies on the seabed, shore or reef. The Encyclopedia of Australian Shipwrecks is a most valuable reference for divers, geneologists, maritime archaeologists, maritime historians - indeed anyone interested in our maritime heritage. Hardcover, dustjacket, 1232 pages, 190 x 250 mm portrait size, a small number of photographs, 40 maps, gazetteer, glossary, bibliography, chronology, statistics, and research advice. $68.00, plus $12.00 postage anywhere in Australia (includes GST). Overseas orders welcome of course. A Listing of Non-sail-powered Australian, New Zealand and South Pacific Merchant Ships. This is an excellent refence for the shipwreck enthgusiast, diver and researcher. It is the first single reference source listing the technical details and histories of a huge number of Australian, New Zealand and South Pacific merchant ships over 45 feet in length since the first steamer arrived in Australia in 1831 through to the present time. With 7,500 entries, this landmark work contains far more information on the subject than any previous publication. Where the information could be obtained, the record includes gross tonnage, year built, ship type, dimensions, builder, build location, original owner and subsequent names and owners and periods of ownership, as well as final fate. Softcover, A4 landscape format, 316 pages. $58.00. This excellent book is ideal for those wishing to dive or learn more about the ships sunk off the southern NSW coast. Eighty-seven ships are covered, most are steamers, and most have the GPS location markings, and/or visual guides, and location charts. Site information is covered and a history of the vessel, and its final moments. Includes 116 illustrations. The wrecksite drawings are of prticular interest. Softcover, 160 pages, mono photographs, charts, drawings, ship index, quick reference of losses, list of ships known to have been lost but not found. And includes a CD-ROM. State-by-State including maps and diving notes. Published by A.H. & A.W. Reed Pty Ltd., Sydney, 1981. It covers, somewhat briefly, the major wrecks in each of the states of Australia, particularly those shipwrecks that can and have been dived on, and significant strandings.Condsiering the other material available by Jack, it does not add significantly to our wreck knowledge, but is a most hndy reference when considering the total coastline of Australia. Hardcover, dustjacket, 120 pages, index, bibliography, mono photographs, a few colour plates. No longer in print. try second-hand dealers. Christopher Milligan and John C.H. Foley. ‘Jap sub sinks hospital ship!' screamed the world's press in May 1943. The unarmed and brilliantly lit ship was suppoosedly immune from attack, but diown she went to a Japanese torpedowith the loss of 268 of the complement of 332. The death toll was the highest of any merchant vessel sunk by submarine in the Pacific during World War 2. Fifty years later however the innocence of the ship has been questioned - was she carry munitions? This is a remarkable book, exceptionally well researched with a forward by Professor Geoffrey Blainey. It asks many questions, and resolves a few. Great reading. Hardcover, 338 pages, mainly mono prints. Jack Loney and Peter Stone. Neptune Press, 1980. Now well out of print. Only one copy available. Sorry, sold. The True Story of the Mad Heretic Who Led History's Bloodist Mutiny. "The true story of mutiny, shipwreck, murder an survival". The tragic sago of the Dutch East Indiaman Batavia, lost off the Western Australian cost in 1628, has been told many times, and rightly so, for it is a true story that no writer of fictiuon could imagine. Unlike the reality of our early history, of which the Batavia plays but a minor part, the baddies do get their just deserts. Led by one man, the evil Jenonimus Cornelisz, some 120 people died by his hand or his orders, for no reason other than they did not suit his purpose. This book is a master of research, providing an entry into the power of the Dutch East India Company, which lasted more than 200 years, and the control of the spices trade from the Indies. Someone will make a film of this one day - and it won't be pretty viewing. (My choice - Alan Rickman for Cornelisz, Anthony Hopkins for Commander Pelseart, and Mel Gibson as an occasional fish). Softcover, 398 pages. $28.00 Highly Recommended. This is in effect a second volume to the book of the same name. It refers to the Bass Strait ferries between Melbourne and the Tasmanian ports of Hobart, Launceston, and Devonport; also to King Island; and the victorian western ports of Port Fairy and Warrnambool, and to Lakes Entrance to the east. Covers also the wonderful Port Phillip excursion ferries, and general ferries within Port Phillip. Softcover, oblong (landscape) format, 92 pages, index, bibliography, mono photographs. $24.00 None available. The 1797 wreck of the merchant ship Sydney Cove. Regarded as the first significant recorded shipwreck on the eastern side of the Australian continent, the Sydney Cove was beached on Preservation Island in the Furneaux Group, eastern Bass Strait on 9 February 1797. The voyage by boat and land back to Sydney by some of the crew, the deaths and rescue of he others, the discovery of Bass Strait, the salvage of the rum and the eventual re-discovery and excavation of the wreck site make Cargo for the Colony the most significant maritime publication on a single shipwreck in Australia since Hugh Edwards' Islands of Angry Ghosts. This is not just a shipwreck narrative. It is about our early existence in a hostile country, the greed and skill of early mariners, and the ambitions of our early settlers. From the early trade links, to the archaeological excavation of the site, this is a must for all Australians and anyone interested in early maritime adventures. Andrew Lemon and Majorie Morgan. COAL HULKS OF PORT PHILLIP BAY. The Recovery and Conservation of Relics from HMB Endevour. The third in the superbly researched series on New South Wales shipwrecks by this author. (See previously released ‘The Vanished Fleet of the Sydney Coastline', and ‘Shipwrecks, Storms and Seamen'). Unfortunately the author notes that it is the final book in the series. This one covers the ships: Dandenong, Barrabool, Lady Darling, Austral, New England, Ly-ee-moon, John T. Berry, Alhambra, Merksworth, Maitland, Hereward, Nerong, and Fitzroy. Also includes an update on some of the vessels in the previous two books. Softcover, 168 pages, mono prints. EXPLORING SHIPWRECKS OF WESTERN VICTORIA . A personal account of diving the Loch Ard, Schomberg, Falls of Halladale and other wrecks. The author was Curator at the Flagstaff Hill Maritime Museum. FAST COMPANY: THE LIVELY TIMES AND UNTIMELY END OF THE CLIPPER SHIP WALTER HOOD. Great expectations were held of the British clipper Walter Hood, however she was wrecked in mysterious circumstances near Ulladulla, on the east coast of Australia in 1870. The wreck has been dived on many occasions. Softcover, oblong format, 132 pages, mono photographs. On the afternoon of 3 November 1927, Sydney residents were shocked by the news that forty passengers on the ferry Greycliffe were dead after a collision with the liner Tahiti in Port Jackson. Ferry transport on the magnificent harbour remains a major means of commutation, and so the effect on the population of Sydney was devastating - much like the Granville train disaster in more recent times. But why did such a tragedy occur? Why did the ferry appear to cut across the bow of the Tahiti, resulting in the wooden ferry being splintered, capsized, crushed, rolled over and sunk? This is an immaculately researched book, with full graphic detail of the lead-up to the collision, the tragic event, the rescues and the inquiries. It is not only about two ships but of the people involved, the victims, the survivors, the rescuers, the perpetrators. The Tahiti was hardly scratched, but she too was lost just three years later. A superb book. Hardcover, dust jacket, 211 pages, mono photographs, extensive reading list and references, victims and survivors lists, index. $38.00. We are delighted to see this superb book back in print, perhaps the finest book written on an Australian shipwreck. A fascinating read about ‘murder, mayhem and mutiny' when the Dutch East Indian merchantman Batavia was wrecked on reefs of the Abrolhos Islands in 1629. What followed was even more horrific for the survivors of the wrecking, with over 125 men, women and children slaughtered in cold-blood by one of the most evil men to have sailed the seas. The book is story in two parts: the loss of the ship and the murders on tiny Beacon Island, and the location and salvage of the ship by Western Australian divers. The author, one of Australiaa's best known divers, was awarded the Sir Thomas White Memorial Prize for the best book written in Australian in 1966. It has been out of print for some time with this new revised edition appearing this year, 2000. Softcover, 228 pages, mono illustrations. $34.00 Highly Recomended. Gifford D. Chapman. Roebuck Society Publication No. 6. 1972. Hardcover, dustjacket, 87 pages, index, mono plates. No doubt the most authoritive book on the shipping disasters and general losses off Kangaroo Island, southerm South Australia. ... Converted into Floating Docks, Bathing Ships and Bethal Ships of Port Phillip Bay. Call them the forgotten fleet if you like, but many of these workhorses led glorious lives before being put out to pasture so to speak. Many of course were purpose built, and because their lives were not so glamorous, they are rarely mentioned in the historic texts. And as for their final demise, well, who cared? Very few were actually wrecked in service - most were cut up, scuttled or simply abandoned. But there provided an important servic on Port Phillip. The author, a retired merchant and naval seaman, is most thorough, brought about by a dedication to rsearch of maritime matters in Victoria. Some 150 vessels are listed, with a further 150 associated vessels included. The text is detailed, often a chronology of events. Softcover, 152 pages, mainly mono photos, seven in colour, index.$26.50. MURDER, MAYHEM, FIRE & STORM. Covers some of the major wrecks in Australian waters: the Dutch wrecks, Pandora, Cataraqui, Dunbar, Catherine Adamson, Admella, Maria, Loch Ard, Quetta, HMAS Sydney, Centaur, and the mysterious Mahogany Ship. Nicely put together in the one volume, it makes for interesting reading even though most of the ships mentioned have been covered in some detail in other publications. An appendix covers the wreck site conditions which is useful, and rthe biographic references are extensive. A good read, particularly if you havn't read about these ships before. Softcover, 102 pages, mono prints. The Cataraqui, Australia's Worst Shipwreck. Andrew Lemon and Marjorie Morgan. She was more than our worst shipwreck - she remain our most tragic civil disaster. Over four hundred people died when the immigrant ship hit the western coast of King Island, at the entrance to Bass Strait, in 1845. Only nine survived. Researched in England, Canada and Australia, the very detailed book covers the political, social and economic circumstances of those on the ship, and why they did not reach their promised land. As the author's indicate, "it restors the identity of the victims". For the diver, there is nothing to see beneath the surface. On land, a stone cairn heralds its location where the visitor can ponder on the horor of this particular shipwreck - so close to shore, indeed, 'on the rocks', but so far from their opportunity to live a new life. This is a book that should be compulsory rading in high school Australin history, as it covers so much that was significant in the development of our country. Hardcover, 188 pages, index, notes and sources, complete with passenger list. A few mono prints. $55.00. This hardcover edition well out of print - no more copies available. 1986. SHIPS IN THE CORAL Hector Holthouse. 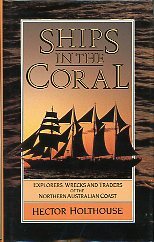 Explorers, wrecks and Traders of the Northern Australian Coast. There werec two editions, but more like two separate books; the second edition was completely rewritten. First published by Macmillan Co., Melbourne, Sydney. 1976. Hardcover, dustjacket, 146 pages, mono prints, some colour plates, medium format. Then a revised edition published by Angus and Robertson in 1986. Hardcover, dustjacklet, 336 pages, many mono photographs and drawings, no colour, smaller format. A definitive work on the ships that sailed through and along the Great Barrier Reef, to coastal ports and out into the Pacific and north to New Guinea. Many of these ships were lost so it is a valuable source of historic information for divers. It is a most thorough book, with indications of early maritime contact with the Chinese and Malays; the early xplorers such as Cook and Bligh are featured of course, with the careening of the Endeavour in 1770 to the grounding of the 58,000 ton tanker Oceanic Grandeur in 1970. Between that period, more than a thousand ships have come to grief in the reef waters. Published by The National Press Pty Ltd, Melbourne. Eighty-five pages, a few mono prints. knowledge of the wrecks of the Young Australia, Falls of Halladale, Schomberg, Loch Ard, Newfield and several others wrecked along the western Victoria coast. These are first-hand accounts, rich in annecdote and historical value. The historic data, particularly in terms of dates, is sometimes inaccurate. The strengh of the book is its contemporary descriptions of events. I had the pleasure of meeting Jean MacKenzie many years ago, in Peterborough, and found her to be a remarkable lady. Mrs. Margaret E. MacKenzie was blind for the last 12 years of her life. As she grew old the past became very dear to her and she deeply regretted not having written of the shipwrecks she knew so well while she still had her sight. Wilh the return to Peterborough of her daughter Jean they decided to commence work on the book, Mrs. MacKenzie relating the stories and Jean writing them down. This began as a duty but before iong Miss MacKenzie became deeply interested and absorbed in her task. After the first edition of "Shipwrecks" was published in 1954, Miss MacKenzie continued to collect information about wrecks to the west of Peterborough, (or although her mother knew something of ihem she was not familiar with the details. "Since the loss of the Trial (Tryal) in 1622 more than seven thousand shipwrecks have occurred in Australian waters. A significant number of these have now been ocated - often revealing theselves as time capsules providing fascinating insights into marine transportation, cargoes and early colonial life." So states the blurb on the fly of this excellent book. I would have said that the number of wrecks is more in the order of 10,000, probably more, and that the number found is rather insignificant when one considers the aspect of quantity - but, quite significant if we consider the historical importance of the wrecks that have been, and more important, competentally researched and investigated in situ. To continue the blurb... "This is the story of how a unique underwater resource has been consertved and protected as part of the nation's rich maritime heritage - including wrceks associated with early exploration, colonial trade, whaling and the introduction of steam technology. Containing comprehensive maps and many previously unpublished photographs, Shipwrecks Archaeology documents the work of leading maritime archaeologists on some of Australia's most important shipwreck sites." Yes, indeed we have here a description of exceptional woprk on several important wrecks: Batavia, Sirius, Pandora, Sydney Cove, Rapid, Clonmel, James matthews, William Salthouse, Water Witch, Cheviot, City of Launceston, Zanoni, Xantho and Tasman. Each ship, ie chapter, is written by an expert in their field, a maritime archaeologist and/or historian who has had an intimate reltionship with the vessel. And how fortunate we are in this country to have such people as Anderson, gesner, Green, Harvey, Henderson, Jeffery, McCarthy, Nash, Richards, Sexton, Stanbury, Staniforth and Strachan... and many others who have also contributed to the maritime archaeology on the wrecks. This is a surperb book which covers my doctrine of judging an excellent publication - the three ‘E's' - does it Educate, Entertain and Encourage: it certainly does. It is a wonderful source of knowlegde, a great read, and an enthusiastic inspiration for us to appreciate our mritime heritage and to preserve what we can of its physical representations for future generations. I should also add that the book itself is superbly prsented, which apprears typical, it seems, of anything that Mike Nash puts his hand on. An excellent read covering the expected shipwrecks - such as the Batavia, Loch Ard, Cataraqui, Dunbar, Sirling Castle and Quetta - but also the ‘missing in action', HMAS Sydney, the ship that stopped a city, the Lake Illawarra, the tragic Sydney-Hobart tace of 1998, and dare we mention it, th dramatic rescues o Bullimore and Dubois in the far souther Indian Ocean. Softcover, 336 pages. Colour and mono prints is central section, index and bibliography. SHIPWRECKS AND INCIDENTS RELATING TO THE PORT OF ST. HELENS, AND UP TO EDDYSTONE POINT. The title says it all: a most valuable book on losses and incidents off the north-east coast of Tasmania, from 1834 to the year 2000. "The bar at St.Helens and the off-shore reefs proved to be a graveyard for many vesselks and fishing craft, and this book is an attempt to collate these incidents from printed sources and local knowledge". The author is a well known maritime historian and lives at St.Helens. Softcover, 58 pages, mono and colour prints. SHIPWRECKS AROUND PORT PHILLIP HEADS. Bob Wealthy and Stan Bugg. An excellent book, giving details on the major shipwrecks visited, with land bearings and GPS co-ordinates to locate each vessel. Includes submarines and Ship's Graveyard. Just enough history to provide background to each vessel. Particularly useful as it indicates the condition of each ship as she lies today. Bob Leek and Peter Taylor. A small booklet of only thirty-three pages covering some 120 vessels, including total wrecks, stranding, burnings, sinkings and refloatings, at or nar Williamstown, on Hobsons Bay, Port Phillip, Victoria. The description per incident is brief; the source reference is of particular value. Index, source list, no photographs. 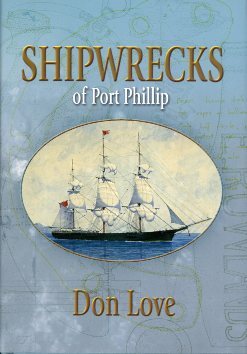 The following five books make up the shipwreck series authored by Don Love, the most comprehensive books on Victoria's shipwrecks ever published. And Don plan's for at least one further book, on Port Phillip - and more if I can talk him into it. Each book is $46.00. All five books are available at a special price of $175. They are truly magnificent books. No. 1 in theVictorian Shipwrecks Series. Don Love. Exploring the fate of 129 ships lost along the East Gvippsland, Victoria, coast from Corner Inlet on th east side of Wilsons Promontory to Cape Howe, between the years 1797 and 1945. Complete with incident reports, and where the wrecksite is known, details on the wreck's condition and diving possibilities. Includes many photographs and line drawings, a chart where the known wrecks are located, and a full list of referencs on each vessel. A most detailed book, and a valuable contribution to our maritime knowledge. Produced with the assistance of Heritage Victoria. No.2 in the Victorian Shipwrecks Series. Once again the author has come up with an excellent book, the second on the Victorian Shipwreck series to be released. This covers eighty-four ships from Wilsons Promontory west toward Cape Schanck, between 1839-1945. The research is thorough and the presentation excellent, with oprimary rferences provided. Hardcover, dustjacket, 126 pages, mono photographs, glossary, index. No. 3 in the Victorian shipwreck series. Don Love. No. 4 in the Victorian Shipwrecks series. Don Love. No. 5 in the Victorian Shipwrecks series. Don Love. Exploring the fate of 173 vessels lost within Port Phillip, Victoria, Australia - from 1840 to 1943. SHIPWRECKS OF THE NEW SOUTH WALES CENTRAL COAST. Vol 1 1800-1899. This books begs comparison with those by Loney, Gleeson and Richards. Being specific in time period and region, the author is able to expand on details of the wrecks in the region from Wollongong north to Newcastle. References are sited with each wreck description, thus assisting those who wish to take their own research further. Greig is a great guy and will be able to supply. The author of ‘The Vanished Fleeet of the Sydney Coastline' has complemented his previous excellent book with more tales of mayhem on the New South Wales Coast. This new volume covers in detail the wrecks of the Catterthun, Cawarra, Keilawarra, Oakland, Bega, Advance, Currajong, Satara, Macleay, Wandra, and Merimbula. Gleeson's meticulous research is matched by mono and colour photographs, and in situ drawings of the wrecks by Steve Purvis giving an excellent appreciation of what remains on each site. Softcover, 168 pages. A History of the Imperial Japanese Navy Fleet Submarine Sunk in Northern Territory Waters. The historic Japanese submarine lies on the bottom of the Timor Sea and has been protected under the Commonwealth Historic Shipwreck Act, the only enemy vessel to have been so declared. Controversy surrounds the submarine - its war operations, subsequent salvage attempts and now Australian government protection. This is an excellent read, the closest we will get to know the submarine. Softcover, 132 pages, mono, large (A4) format. THE AUSTRALIAN AND NEW ZEALAND LIST OF VESSELS LOST, MISSING OR TAKEN FROM ACTIVE SERVICE 1874-1949. This is a most comprehensive list of some 5700 vessels, in tabulated format of vessel name, rig, tonnage, port of registry, date of build, particulars and date, based on the Register of Australian and New Zealand Shipping. This register was published annually by the Marine Underwriters and Salvge Association of Victoria Limited from the returns furnished by the customs authoritoes in Australi, New Zealand, Fiji and New Guinea. The author acknbowledges there were errors in the register as to be expected from any hand-written and maintained register. A most valuable tool for the mritime historian and enthusiast. Published by Rigby limited, 1971. Harcover, dust jacket, 134 pages, mono and colour prints. If ever a wrecksite (or two) be inaccessible, then surely th sites of HMAS Perth and USS Houston rate a mention. Lost during the easrly months of the Pacific war, they went down courtesy of Japanese dive bombers, off the north-west Java cost, at the north-east entrance to Sunda Strait. The author is not one to let a challenge go by, so in 1969 he set out to locate and dive the vessels. This is his story. It is, in many rspects, irrelevant that he had the hardship of diving with only one leg, but Dave Burchell would not regard that in any way as a hardship. (See his autobiography One Foot in the Grave, an My World). The loss of the Dunbar off Port Jackson heads on the night of 20 August, 1857, with the loss of 121 lives out of a complement of 122. Just what did happen to the British clipper after her long journey - so near to the end of her journey. Softcover, 126 pages, mono photographs. THE KOOLAMA INCIDENT In The Timor Sea, 1942. The motor vessel Koolam was attacked by three Japanese dive bombers in the Timor Sea in Fenruary 1942, and limped ashore on th far north-west coast of Autrali. One huindred and sixty crew and passengers made the shore safely. After establishing a camp, the master and som crew retuned to th ship and managed with great difficulty to free her. In thge meantime, the land survivors were having their own hardships but after a courageous rescue effort with the assistance of aborigines, and Bennedictine monks, most made the one hundred and fifty kilometre trek through some of the harshest of Australia's bush, to safety at the mission, and then on to Wyndham. In the meantime, the Koolama limped into Wyndham, only to be bombed again at the jetty. She rolled on her starboard side and was a total loss. The book covers these land and sea incidents and the acrimony between the master and the chief engineer - hence the subtitle, Malice or Mutiny. An interesting read, and a valuable contribution to our wartime and maritime history. Softcover, 215 pages, mono plates. THE QUETTA - Queensland's Worst Disaster. The story of the loss of RMS Quetta in the Torres Strait in 1890 with the loss of 134 lives - only five women were saved, including a baby girl. The ship has been relocated and dived upon. This is an incredible story of hardship and tragedy, exceptionaly well researched by the author. The history of the ship, her last voyage, subsequent inquiry, and the survival of the women are well covered in detail. Softcover, 162 pages, mono and several underwater colour photographs. Out of print, no longer available; second-hand copies occasionally pop up. This is a beautifully produced full-colour hardcover book detailing the loss and subsequent massacre of 'survivors' of the Dutch ship in the Abrolhos islands off the Western Australian Coast in 1629. The underwater photographs are particularly interesting, as the book covers the post discovery period, and raising of materials. The tragic history of the ship and its occupants is covered in detail, with descriptive drawings provided where photographs were not available. The discovery of the Batavia is fascinating. A marvellous book for anyone interested in the underwater world, and in Australian history in particular. Medium format, hardcover, dustwrapper, 336 pages, full colour. THE VANISHED FLEET OF THE SYDNEY COASTLINE. Following on from his excellent book on the Yongala, Sydney diver Gleeson has produced another superb book on the wrecks in Port Jackson and nearby ocean sites. The 168 pages of medium format, softcover book contain many mono photographs, and sixteen informative and creative colour photographs. Wrecks include the Birchgrove Park, Undola, Annie M Miller plus a dozen others. A must for all wreck divers and those interested in maritime history. Angus & Robertson, Sydney, London, Melbourne. 1957. Hardcover, dustjacket, 379 pages, no index, no images. THE WRECK OF THE BARQUE STEFANO. The Stefano was wrecked off the north-west coast of Australia in 1875. Ten men struggled ashore. Some were driven to cannibalism (which is just down the road near Geraldton), and only two survived, rescued by aborigines, and then returned to civilisation by a pearling lugger. Their home base was Dubrovnik, in what we used to call Yugoslavia. This is quite an incredible story. THE WRECK OF THE SAILING SHIP NETHERBY. A Miracle of Survival. The author is ell known for his other excellent publications on shipwrecks off the Victorian coast, and other titles relating to war and maritime history. This book covers the loss of the ship and the rescue of some 450 immigrants from the shipwreck of the Netherby just south of the township of Currie on the west coast of King Island, western Bass Strait, in 1866. Softcover, saddl stiched, 48 pages, colour and mono prints, charts, passenger list. TASMANIAN SHIPWRECKS. Vol 1. 1797 - 1899. Graeme Broxam and Michael Nash. No dount the definitive work on the shipwrecks of Tasmania, including those off ther Bass Strait Islands. An exceptionally well rehearsed book, one of the finest maritime history titles published in Australia. Detail is extensive. Some diving information. Many interesting photographs.Hardcover, dust jacket. TASMANIAN SHIPWRECKS Vol 2, 1900-1999. Sorry, well out of print and no longer available. (TREASURES, TRAGEDIES AND TRIUMPHS OF) THE BATAVIA COAST. Max Cramer has had a remarkable life. As the primary discoverer of the Dutch merchantman Batavia in the Abrolhos Islands, he has been actively involved in the Dutch wrecks along the Western Australian coast. His discovery and early diving on the wrecks makes for fascinating reading as they are a first-hand contemporary account of diving and, eventually, maritime archaeology. It tells of his early days at Shark Bay, hard-hat and commercial diving, treasure, spearfishing, and replica ships. The discovery and subsequent excavation of the Batavia is covered in some detail, as are the other Dutch wrecks Gilt Dragon, Zutydorp and Zeewyk. Other shipwrecks mentioned are the Georgette, Mayhill, Stanford, Stefano, and HMAS Sydney. A great read with down to earth writing and fascinating detail. Hardcover (laminated boards) 332p, mainly mono photos and diagrams, with eight colour plates. On the afternon of March 23, 1911, the Adelaide Steamship Company's steamer Yongala left Mackay, North Queensland for Townsville. Within twelve hours, all 121 crew and passengers went down with the ship during a fierce cyclone. Forty-seven years were to pass before her remains were positively identified. She is now one of the most popular scuba dives in Ausralian' waters. This excellent, revised book, tells the story of events leading up to her loss, and the subsequent discovery of her last resting place. Hardcover, 120 pages, mono and colour plates. Hardcover, dustjacket, 159 pages, mono prints, index, references. Covers forty-six ships (including four submarines) scuttled in or near the official ships graveyard outside Port Phillip heads, off Barwqon Heads. Many of these vessels are regularly visited by scuba divers, and several have been located by the authors. These are the most comprehensivehistoric descriptions of the vessels that have met their end in the graveyard. The book is toitally historic with no detail on the current condition of the vessels, nor diving practices to be adopted on each vessel. A very important book for thosse withing to know more about the old abandoned vessels that they dive on. $45.00. The Notice to Mariners was published in the New South Wales gazette and then after Victoria was formed, in the Victoian state gazette, advising mariners of all manner of information relating to shipwrecks, floating wreckage, buoys, and anything else relevent to the course of their profession. This small but very handy reference provides relevent extracts of information of interest to today's scuba divers, and anyone interested in our mritime history. Some ships struggle through life, perform their duties, and die on a reef or at the shipbreakers without achieving any great success. The Wanderer was no exception, although initially the auxiliary schooner led a glamous life. She was built at Greenock in 1879, ".. the most modern, most luxurious steam yacht ever built... she was the epitome of luxury travel". Designed to carry just one family on a world cruise, she had a crew of over fifty - and a parrot. Initialy owned by the wealthy Charles Joseph Lambert, she went through a number of ownership and name changes - Vagus, Consuelo, Investigator, and finally Sea Lark III in 1920 when sold to Patrick Steamship Co., of Sydney. She ended her days as a tramp steamer, and was finally scrapped around 1925.Based on the papers of the Lambert family, this is a fascinating read. UNFINISHED VOYAGES - Western Australian Shipwrecks 1851-1880. Published by University of Western Australia Press, 1988. 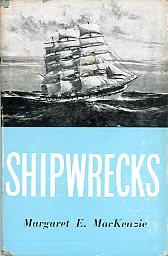 One of three volumes in the series covering Western Australian Shipwrecks. Graeme Henderson joined the W.A. Museum in 1969, and has assisted and later guided the development of the maritime section of the museum through the Dutch shipwreck era, and the colonial years. The book is detailed, and of exceptional value in that it provides a detailed list of sources of information. The Hendersons can also add relevant diving information to the wrecks. A most imporetant work in chronicling Australia's early maritime history. Hardcover, oblong (landscape) format, dustjacket, 308 pages, index, bibliography, mono photographs. Sorry, out of print - as are the other two volumes in the series. WHO LIED? The Ly-ee-Moon Disaster and a Question of Truth. The iron single screw steamer is known to divers although few have managed to dive the treacherous last resting place of the 1202 ship off Green Cape lighthouse. She was the fastest paddle steamer launched in England, with a speed of 17 knots. Two funnels and three evenly-spaced masts gave her a pleasing appearance, before conversion to screw in 1873. Under Captain A. Webber, she left Melbourne for Sydney on 29 May 1886. A day later she met her end on the rocks close under the Green Cape lighthouse, 30 May 1886. She was carrying a large complement of passengers for Sydney and Brisbane, many of whom were journeying north to escape the Victorian winter. With heavy seas pounding her, she broke in two almost immediately, and the forward section, containing the saloon and forecastle, was swept close in shore. Dozens were trapped below and drowned as the ocean swept through the ship, smashing internal fittings to With the aid of the light keepers a line was secured to the wreck; five saloon passengers and eleven members of the crew survived, but all the steerage passengers were lost - total of seventy-one lives lost. At the inquiry, the master found guilty of gross negligence and required to forfeit his certificate. But who was at fault - the captain or third officer - who lied at the inquiry? The book describes the tragedy and explores the conflict between the two. A very interesting book indeed, well reserached and a pleasure to read despite the dreadful circumstances of the loss of life so close to shore. Softcover, 104 pages, many mono photoghraphs, index, bibliography, endnotes. $26.95. 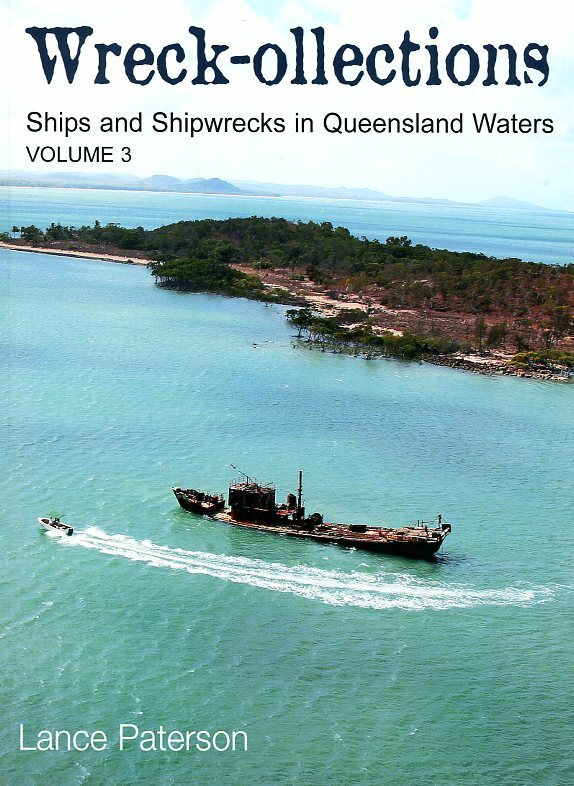 SHIPS AND SHIPWRECKS IN QUEENSLAND WATERS - VOLUME 1. Lance Paterson. SHIPS AND SHIPWRECKS IN QUEENSLAND WATERS. Volume 2. Lance Paterson. SHIPS AND SHIPWRECKS IN QUEENSLAND WATERS. Volume 3. Lance Paterson. Author's Note from Volume Three. Research has already started on volume 4 of Wreck-ollections: Ships and Shipwrecks in Queensland Waters. Volumes 1 to 3 cover around 900 accounts, for which information was reasonably accessible. Information on the planned 350 entries for volume 4 is getting harder to find; however advances in digital technology and communication are enabling long lost wrecks to be discovered and identified. The National Library of Australia's Trove website allowing online searches of major newspapers has made it possible for me to do some research at home; previously I travelled to the State Library of Queensland in Brisbane as the nearest source. Not all regional newspapers have been digitised however, and travel is still necessary. Every year along the coast of Queensland a great number of vessels touch reefs, run onto beaches or get stuck in mud for many and various reasons. Rarely do we hear of such incidents unless they are associated with a significant oil spill or some other newsworthy factor. But any of these events could at any time become a disaster, to the vessel or vessels involved and their crew, and to the environment. As the number of massive container ships entering and passing the Great Barrier Reef increases, I hope the extension from 1 July 2011 of the mandatory ship reporting system in the Great Barrier Reef and Torres Strait to the southern boundary of the Great Barrier Reef Marine Park will help keep accidents to a minimum. The value of such an excellent book such as this results from not only the deication of the author toward historic research but moreso from his actual ‘hands-on'experience of the wrecks and locality. As proprietor of the charter boat Esperance Star, Trevor has dived southern Queensland extensively, and with his passion for wrecks and the ability to string more than two words together, he had povided a very interesting, well written and valuable book. It commences with an overview of shipwrecks: ‘shipwreck anatomy', identification, safety and artifact restoration, before over one hundred pages on the known wrecks, and those ships lost yet due to be found. The history and cause of the loss, and how she now lies, is complemented by the author's own experiences. GPS marks add to the value. A chapter on Looking for AHS Centaur is interesting. A valuable historic and diving reference. Softcover, mono and colour photographs, 208 pages, references. $35.00. No longer available - not likely to be reprinted. The western entrance to Bass Strait was notorious for bringing to a premature end many ships, passengers and crew after crossing the Indian and Southern Oceans on their way from England to Port Phillip. An attempt at threading the narrow pass between King Island and Cape Otway was fraught with danger, requiring astute seamanship and a hell of a lot of luck. The western coastline of Victoria (Australia) is dotted with tragedy. The author explains why this is so, and covers in detail the wreck of the Loch Ard, Schomberg, Marco Polo and Lightning, all of which have been subsequently located and dived.This is the 1988 second edition of the book initially published in 1977. An excellent book. Softcover, 194 pages, mono photographs. They tell me Darwin harbour is not the best place to dive, but Tom Lewis has done an excellent job in telling us what we are missing. The writing is tight and yet detailed, with excellent mono photographs. Softcover, medium format, 98 pages. Sorry, out of print, no longer available. Published in 1966. The coastal steamer was wrecked off the south coast South Australia in 1859. Eighty-nine lives were lost from a complement of 113, and yet the ship was less than a mile from shore. Hardcover, dust jaclet, 184 pages, well illustrated. The definitive work. WRECK OF THE LOCH ARD. Published in 1971. The well-known Victorian ship was wrecked near Port Campbell in 1877. Hardcover, dust jacket, 120 pages, well illustrated. The definitive work. The series commenced in 1972 with author Charles Bateson, published by A.H & A.W.Reed. After Bateson passed away, Jack Loney was seconded by the publishers to write volume two, which was published in 1980. Jack continued with the series under new publisher List Publishing, and volume three was released in 1982. In 1987, Jack released volume four under his own imprint, Marine History Publications, and followed this in 1991 with volume five, an update of the previous four volumes. Finally, Volume Six, no doubt the last in the series, was called The Australia Run, and was authored by Jack Loney, with additional information added after Jack passed away in 1995 by Peter Stone. This was released in year 2000, again under Marine History Publications under Jack's widow, Padge Loney. All titles are out of print, with the exception of Volume 5 (soft cover only), and Volume 6. AUSTRALIAN SHIPWRECKS VOLUME 1 (1622-1850). Charles Bateson. Published in 1972. Including vessels wrecked enroute to or from Australia, and some strandings. Hardcover, dustjacket. 268 pages. Illustrated throughout. Second hand copies only, when available. AUSTRALIAN SHIPWRECKS VOLUME 2 (1851 - 1871). Jack Loney. AUSTRALIAN SHIPWRECKS VOLUME 3 (1871 - 1900). Jack Loney. Published in 1982. Limited edition. Hardcover, dustjacket, 296 pages. Second hand copies only, when available. Original print run of only 1500 copies so second-hand copies are rare. AUSTRALIAN SHIPWRECKS VOL 4 (1901-1986) - Jack Loney. The definitive work. Australian wrecks this century. Hardcover, 290 pages, 140 photos. This is the fifth edition of the series. The volume updates a further 1000 shipwrecks since 1622, and includes wrecks up to 1990. Limited Edition, 169 pages. Well out of print. Second-hand copies come to hand occasionally in both hard and soft cover. Jack Loney and Peter Stone. Covers those vessels lost between the United Kingdom and Australia. Although the final book in the series, The Australia Run stands alone in its coverage of the vessels lost, not only on Australian shores, but enroute to or from Australia. Includes the loss of the ayleur, Royal Charter, London and many others off tyhe Australian coast, as well as the losses from England on the Australian coast so close to their destination. Hardcover, dustjacket, 360 pages, mono photographs. See also Australian Shipwreck series, above. Covering the Victorian coastline. All $12 until stocks exhausted. Softcover. Various pages. Mono photographs. SHIPWRECKS ALONG THE GREAT OCEAN ROAD. Covers the wreck from Point Lonsdale at the entrance to Port Phillip, through to Portland, ie the western coastline of Victoria. Softcover, 144 pages, mono photographs. Covers those shipwrecks from Point Nepean at the entrance to Port Phillip, through to the New South Wales boarder, ie eastern Victoria. Softcover, 120 pages, mono photographs. MYSTERIES OF THE BASS STRAIT TRIANGLE. The wrecks and mysteries of Bass Strait. Several very fascinating stories. What happened to Great Expectations; the incredible disappearance of Frederick Valentich; and the Glasgow Citizen? Fascinating reading. Softcover, 112 pages. ‘An illustrated history of major shipwrecks, collisions, fires and strandings in Bass Strait from 1797'. An excellent collection of photographs, with extensive captions but little added text. THE SEA WAR IN BASS STRAIT. Few people realise that German raiders and Japanese submarines stalked shipping in Bass Strait between Tasmania and mainland Ausstralia in both wars leaving a legacy of their destruction on the seabed. Covers the freighters City of Rayville and Cambridge amongst others. The definitive guide to shipwrecks off the Victoria (Australia) coastline, shipwrecks. Includes also wrecks in the Kent Group and King Island in Bass Strait, and an extenssive coverage of the wrecks in and Port Phillip Bay, The Rip and outside the Heads. Many mono photographs. Apendicies include heaviest loss of life, lighthouses and lifeboats, the worst yearscollissions, vessels scuttled, salvage rights, and accessible wrecks for the diver. The definitive book on Victorian shipwrecks. Now well out of print. We have the only NEW copies available. Hardcover, dustwrapper, 176 pages. Limited copies. More ships have been lost off the coast of New South Wales, and more undiscovered shipwrecks remain in these waters than any other stretch of coastline in Australia.There is a strange and tragic inevitability surrounding disasters at sea, particularly if they leave a wide spread of wreckage to wash ashore, or perhaps become a battered hulk slowly disintegrating under the ceaseless pounding of giant waves. Tragic though the recording of so many disasters may be, there are also lively and exciting stories of heroism, daring, self sacrifice and colourful deeds to add to our heritage of maritime history. This book, the result of many years of intensive research records more than 1500 wrecks from the early eighteenth century to recent years and is illustrated by a remarkable collection of photographs. Within the compass of these pages are dramatically recorded brief stories of disasters which struck ships along the coastline of South Australia, long recognised as one of the most hostile in Australian waters. From the earliest times when Aborigines presented a serious threat to shipwreck sailors, through the mid 1800's in a period of intense intercolonial trade and overseas immigration, up to the present day, variances in sea and weather have united to destroy scores of ships and lives. This carefully researched book, set against a background of early settlement and development is well supplemented by a unique collection of photographs and illustrations, making it one of interest to readers both young and old. The coast of Western Australia has seen shipwreck incidents more treacherous and stirring as any in thge world. From the Dutch wrecks of the seventeenth century to modern tanker disasters, the largest state coastline in Australia has it all. Massacre and murder, the discovery of the seabed littered with silver coins, and national controversy over wrecks claims are all part of this excellent book. Softcover, 208 pages, mono prints. $28.00 Out of print - no longer available. WRECKS ON THE QUEENSLAND COAST likewsie out of print. WRECKERS, SMUGGLERS AND PIRATES In South Eastern Australian Waters. The title says it all - there were some rather colourful characters along the coast, and luring a ship onto rocks was not above their objectives. Some great tales in this book. Oceans Enterprises, 303 Commercial Road, Yarram, Vic 3971, Australia.